My name is Nanjappa and I live near Bommansandra. I have created this campaign to seek support for my younger's son treatment. He is suffering from a bone marrow disease called Fanconi's Anaemia. Fanconi Anaemia is a gentic disease that mainly affects the bone marrow. It results in decreased production of all types of blood cells. We need to arrange 8-10 lakhs for a bone marrow transplant. My elder daughter, Chitra, is a match to be his donor.We are just short of funds for the transplant. We request for your support. This is the last option we have to save my son. Thank you for all the love and support you have shown my son Nagaraj. He is doing good now. He received the best of the treatment, all due to you support and blessings. We had no hope that we will be able to treat him further when we ran out of our savings and belonging to sell but all the support that we received from this campaign means a lot to all of us. He was in first grade when he fell sick and because of his treatment, we were unable to send him to school. After the treatment, we went back to school and we thought he would have to repeat the year but the teachers suggested that he will be able to go the second grade as he did exceptionally well in the first month of the first grade. I would like to thank all the supporters once again for giving my second his second lease of life. I am Debotri, a fellow at Milaap. 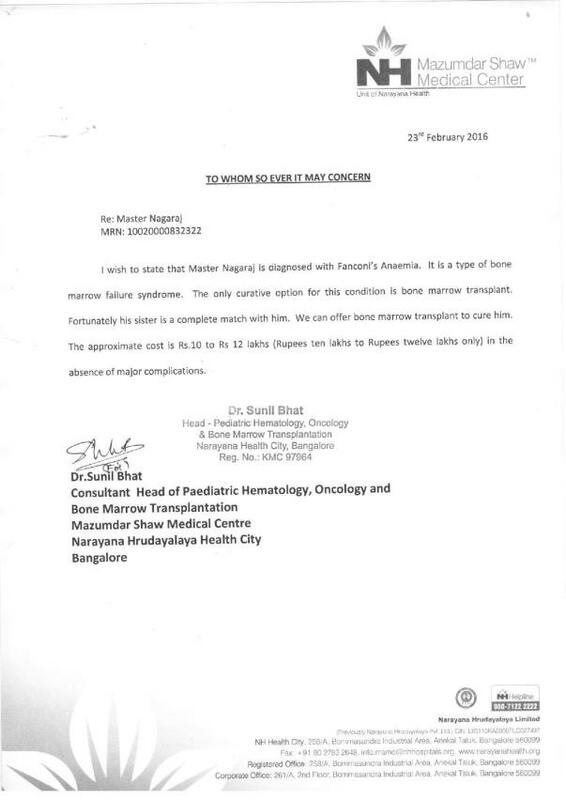 Here is an update on Nagaraj's treatment. I spoke to Nagaraj's mother, this morning. "Nagaraj underwent bone marrow transplant 9 months ago. He is recovering well. His health has improved a lot since the surgery. I want to genuinely thank the donors for coming forward to help my child", she said. Currently, Nagaraj and his parents are staying in a rented house in Bangalore. He needs to be under medication for another one and a half years. The doctor has asked his parents to take him to the hospital even if any health abnormalities come up. "He was a very active child previously. But now, we have been advised to lock him up at home. He has to stay back home all throughout since he is highly prone to infections. This makes him feel angry and irritated. It becomes very difficult for us to handle him since we are also helpless", said his mother. Although they have settled the hospital bills, the family is finding difficult to incur his medical expenses. Apart from this, Nagaraj's other two siblings are staying in their hometown with his grandmother. Thank you, donors, for giving them hope. Your support and contribution will never be forgotten. We want to THANK YOU in the biggest way possible. Please share his story and help him to fight the battle. We will keep you posted on his progress. Here's an update on Nagaraj's treatment. 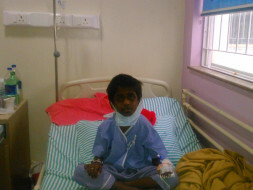 Nagaraj underwent his transplant. He is recovering well but his blood counts are low and needs blood transfusions at times. He will be under observation for the next few months. His elder sister was the donor. The family managed to arrange close to 2 lakhs and this was used as a transplant deposit to go ahead with the transplant since it could not be delayed further. Nagaraj's mother was happy to know about the funds raised but they cannot complete the treatment unless the remaining funds are arranged. She has requested your help to reach out to more people for support. We will keep you posted on Nagaraj's progress. Thank you for all the support. You are awesome. Smile and get well soon.